Phidippus Audax, a photo by Roberto_Aloi on Flickr. Notice the brilliant green iridescent chelicerae used to transport venom! Hide and Seek, a photo by Roberto_Aloi on Flickr. This phidippus audax tried his best to run from me as I took a series of photographs. Picture my camera with full extension tube set in my right hand while using my right hand to encouragement movement so he would peek his body around this tiny plant. "Trying" to Hide, a photo by Roberto_Aloi on Flickr. 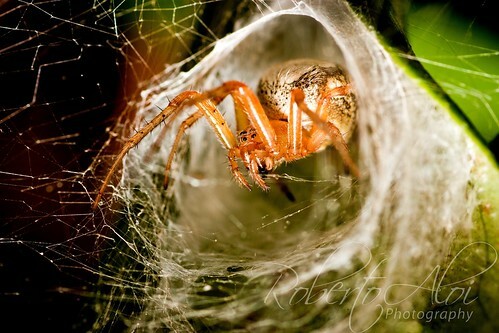 My girlfriend spotted this spider in her garden and thankfully I had my camera nearby. 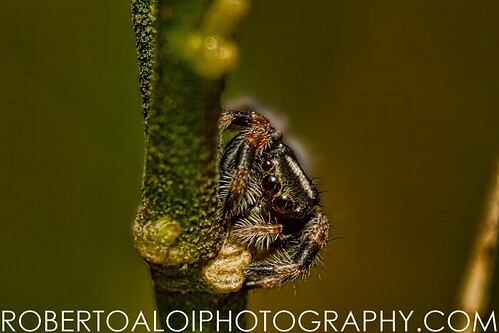 Very small phidippus audax jumping spider found at Riverbend Park today. 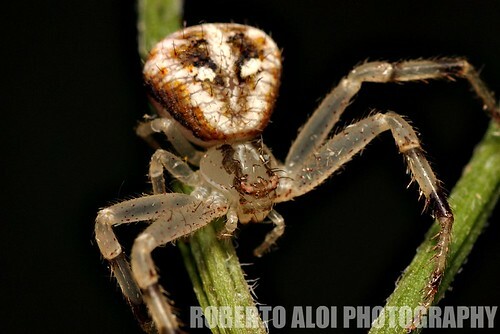 These spiders are typically large in terms of jumping spider standards and are commonly found in North America. So the experts say. I have been searching for these guys the last few trips to a place I spotted dozens previously and have had no luck. 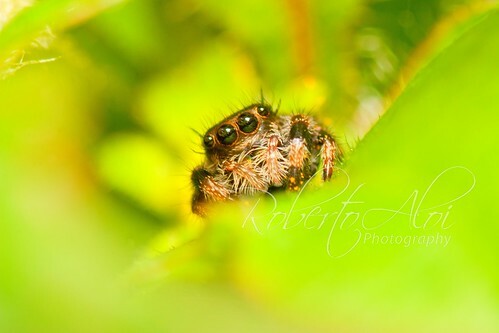 Today I was on my way back to my car and was shooting another insect when I noticed this little guy hiding. 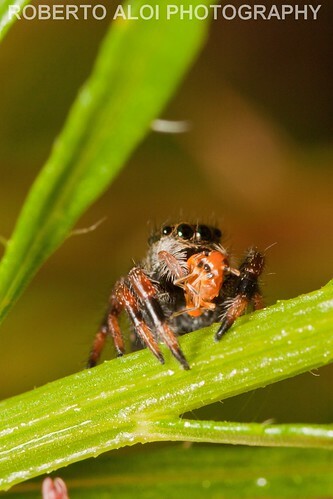 I have dealt with dozens of jumping spiders and from my experience this variety does it’s best to run when approached. Most other jumpers I have photographed, with few exceptions, will look directly at me as if to taunt me and jump towards my camera in an effort to scare me off. 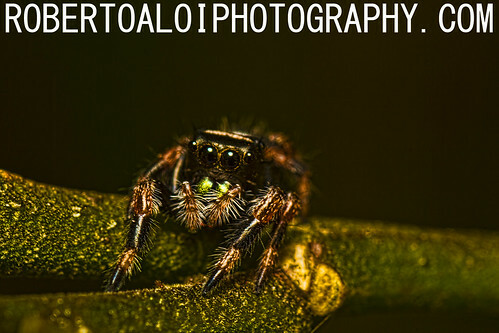 They can jump between 10 to 50 times their body length and are also called bold and daring jumping spiders. 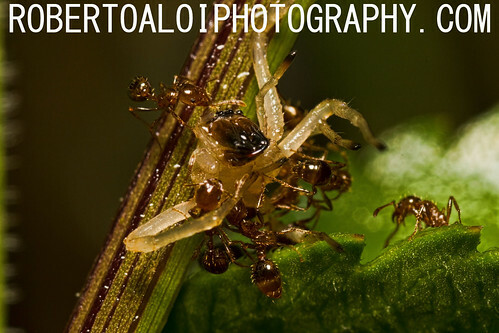 This was at full magnification with stacked extension tubes and handheld. I had my eye on an insect at riverbend and I felt something tickling my arm and apparently this spider had hitched a ride. 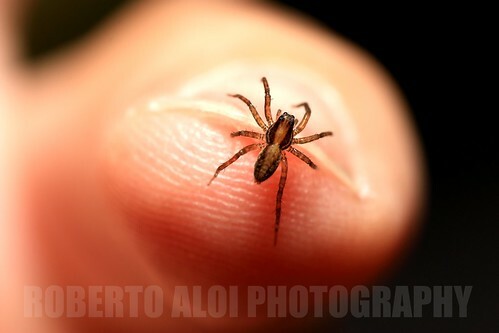 Having your subject perched on your own finger has it’s benefits when shooting macro.